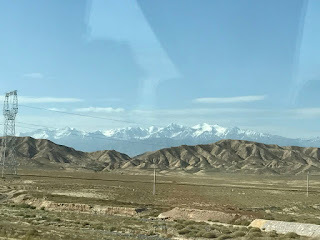 Our Silk Road tour started in Lanzhou, the capital city of Gansu province. It is home to 6.3 million people, of which 3.7 million people live in Lanzhou. That's probably because there are seven ethnic groups who live here, including Tibetans, Hui, Dongxiang, Mongolians and Kazak, as well as Han Chinese. What you first notice about the province is that it's very mountainous. While Lanzhou is situated on the upper reaches of the Yellow River, not everyone has access to water, and so hardy crops are grown, such as corn, millet, and dates. 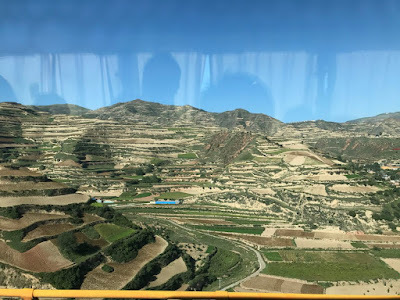 When we rode along the highway we could see terraced fields on hilly areas -- they were in such remote locations, but if there are terraces, there are people. Historically and geographically Lanzhou was an important strategic point along the Silk Road leading to the west towards Xinjiang and Eastern Europe, and east towards Xian. And during the Sino-Japanese war, the Lanzhou corridor was crucial to the Communists in transporting Soviet supplies to Xian. It was so well protected that the Japanese were not able to take Lanzhou. In ancient times, the Great Wall was also extended to Yumen to protect Lanzhou, and we got to see this place a few days into our trip. 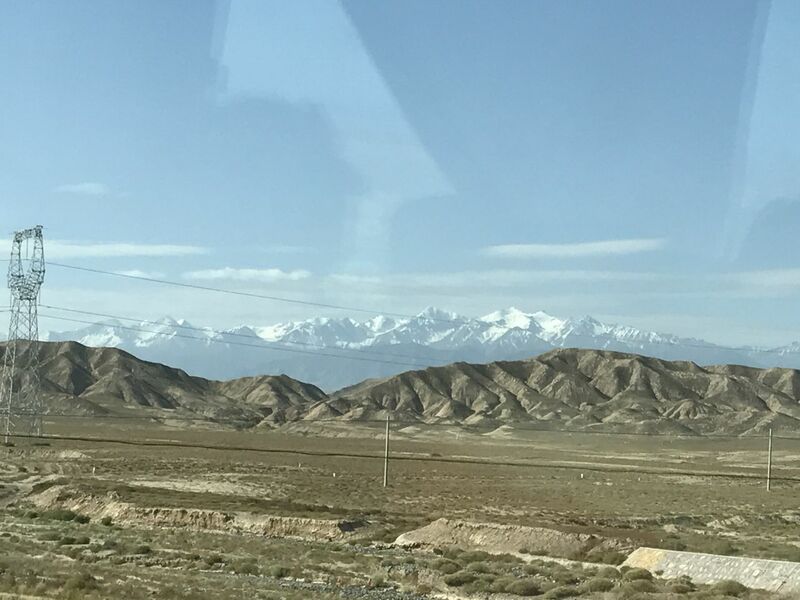 Today's modern Silk Road still considers Gansu province an important one -- geographically it is right in the middle of China, and so all transport links go through here. However, not all the roads are paved smooth, nor efficient. 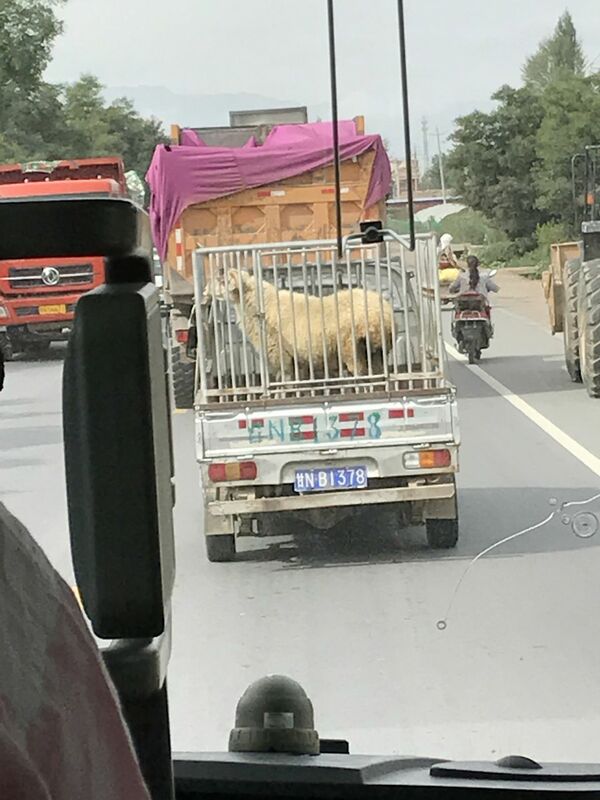 Some highways were single-lane traffic, which mean waiting until the opposite lane was clear before passing trucks carrying cars, fuel, equipment, sheep and pigs. As a result our tour guide would never give us a definitive number on how many hours we would be on the road because if there was a traffic jam, or single-lane traffic, it could slow us down immensely and he wanted to manage our expectations. Periodically we would encounter toll areas where security officers would come on board to check us and our passports. One time one officer looked long and hard at us before he finally advised us all to wear our seat belts. Nevertheless, it was pretty amazing to see so many trucks on the road, but perhaps it was the only way to get goods to remote areas that were not necessarily near the railroad system. It makes you appreciate North American and European highway systems so much more!